Single step lifting and toning and/or neutralisation. 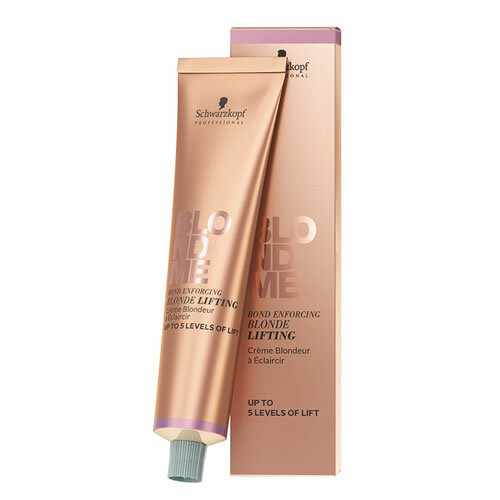 Schwarzkopf BLONDME Bond Enforcing Lifting creams give up to 5 levels of lift on natural bases 6 and lighter with up to 30% white hair. They're formulated with Schwarzkopf's Integrated Bond Enforcing Technology which uses succinic acid to penetrate the hair during blonding and protect those all important hair bonds. The result is blonde hair which keeps its strength and elasticity making it less prone to breakage. Ice—cool blonde with anti-yellow effect. Steel Blue—ideal for ultimate neutralising. 4 shades of white blending cream for up to 100% coverage of 30% or more white hair. Made with Integrated Bond Enforcing Technology to protect hair bonds for beautifully conditioned results.